In July, while on a visit to San Francisco, I made a point of seeking out interesting buildings – and other parts of city life – to photograph. Before leaving home, I Googled “San Francisco architectural photography” and discovered Thomas Hawk’s great website, with tons of suggestions. I did visit some of the places he suggested and will share images from them later. But today’s post is about a building I stumbled upon on my own one afternoon, on my way to meet my son, who works in the Financial District. 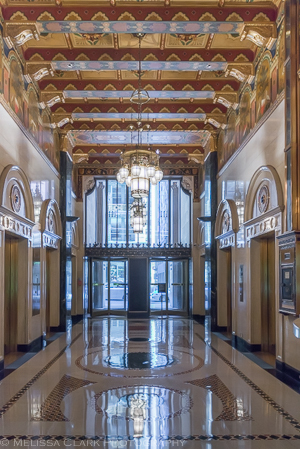 It’s located at 111 Sutter Street, and while technically its rather pedestrian name is the Hunter-Dulin Building, its provenance is anything but pedestrian. It was originally built in 1926, and the “French Romanesque” entryway fits that description. Romanesque arches on one side of the entry to the building, elaborately carved in stone. 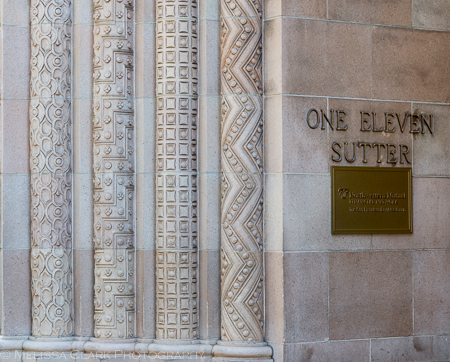 A carving of Mercury stands at the middle of the two banks of revolving doors at the entry to 111 Sutter Sreet. With this amazing entry fronting on the street, I couldn’t resist walking in. Inside were even more spectacular sights. A view back towards the street from the back of the lobby at 111 Sutter. 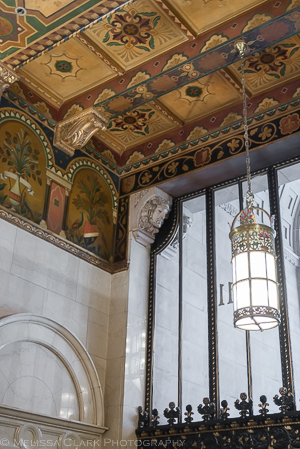 The ceilings were hand painted, and glorious. 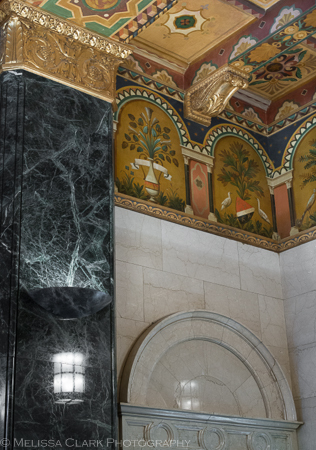 A close up of some of the painted details on the lobby ceiling, framed by a marble column. Another angle on the ceiling, this one including one of the chandeliers. 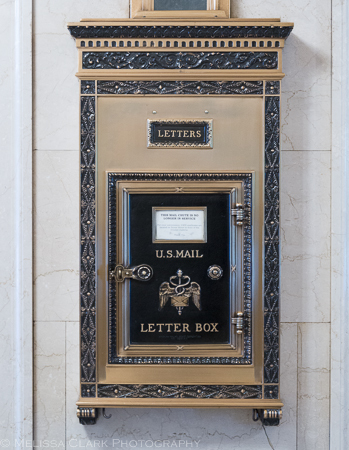 The building was renovated and made more earthquake-proof in 1999-2000, but they kindly left one of the old mail chutes in the lobby for visitors to admire. A non-functioning but gorgeous old mail chute in the lobby. Internet research reveals that the most famous tenant of the building was Dashiell Hammett’s detective, Sam Spade. 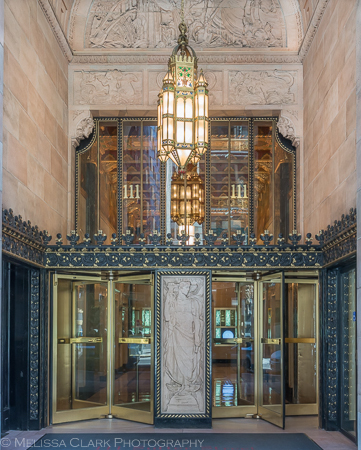 The lobby alone is so gorgeous I stopped by twice, and the security guard was happy to let me take photographs. My main regret was that the light was very low and I didn’t have a tripod, so most of my DSLR shots were taken while bracing myself against a wall, and even those turned out somewhat blurry. But I trust you’ll get the picture (so to speak). 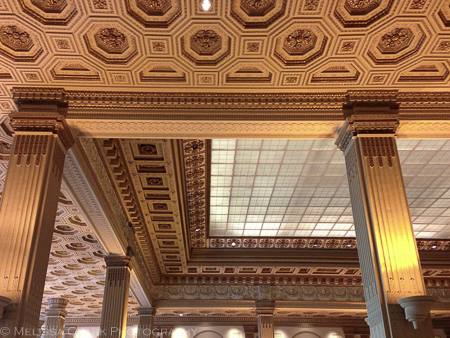 I’ll close with two shots which I took with my iPhone in a bank just around the corner – which connects with 111 Sutter through their lobbies during the week. Those 1920’s buildings were something, and San Francisco is to be commended for preserving them. A bank right around the corner from the Hunter Dulin Building is equally spectacular. My last shot in this bank – I was then halted by bank personnel asking me not to take any more photos for security reasons. 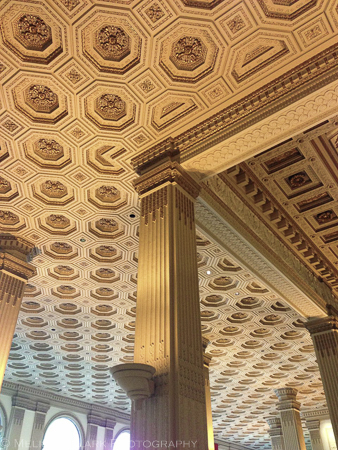 So I won’t identify the bank – but its architecture was stunning.